Scott Shafer, CEO, Jerry Champlin, President & CTO Mobility, end user experience, security, compliance, database, application, and break-fix management have become the fastest growing areas of client demand in the application management landscape. However, most companies in this sector face impediments with regard to fragmented monitoring and systems management solutions, lack of holistic application and infrastructure visibility, demanding security and unending capital expenditures. Moreover, handling partially deployed software and inflexible configurations for custom applications often become a time consuming, expensive and tedious task for enterprises. Providing a solution to these challenges through a predictable SaaS based delivery model is Broomfield, CO based Absolute Performance, Inc. Started in 1997 with a mission to provide application performance management, the company provided monitoring and systems management on a consultative basis. “Over the years, as the needs of our clients changed and expanded, the t e c h n o l o g y and Absolute Performance evolved to fast follow those needs. This evolution was very well received in the marketplace, thereby fostering our growth,” says Scott Shafer, CEO, Absolute Performance. Along the way, the company’s proprietary technology platform—System Shepherd was patented, and continues to be a cornerstone of the company. This proven, SaaS technology provides a holistic view with deep visibility into the performance of the full technology stack from physical and operating system (OS) through database and applications, across multiple centers and hybrid technologies ranging from public and private cloud infrastructure to commercial Unix, AS400 and Microsoft environments. Over the past five years, the company has cemented and executed against two core company strategies—A structured “we listen” methodology to deeply understand and respond to the needs of its clients, and low risk solution delivery through a SaaS model. Shafer believes that these strategies embrace the idea that business drives technology. “We made a strategic decision to deliver our capabilities through a SaaS model whereby we take the risk in deployment and management, and deliver our clients a fully functioning solution” he says. Additionally, Absolute Performance’s monitoring and application performance management solution are effectively a single platform. The company implements System Shepherd focused on applications and end user experience first and then focuses on added infrastructure. “We provide deep visibility into a client’s applications and their specific performance characteristics from both the perspective of the end user and the technology components that comprise the application,” Jerry Champlin, President and CTO of Absolute Performance explains. The company now successfully operates across three lines of business including infrastructure management, Accounts Receivable Management (ARM) outsourcing and technology services. Within these lines, the company continuously caters to the customer needs, and develops products and services that strengthen competitive advantage. “We think through ideas and build solutions, innovate, in a logical space we call ‘the garage’. It’s exciting when we get it right, but always learn from the journey. Most importantly, we recognize that the process of thinking and innovating new products and services is integral for the continued success of our company,” explains Champlin. Absolute Performance operates on a spirit of collaboration, openness, flexibility, and fun on a foundation of strong work ethic and teamwork, with no fear of escalating issues and problems within the company. Absolute Performance adheres to a delivery and growth pyramid with three tiers and cannot move up to the higher tiers, unless the tier below is rock solid. This includes foundation of solid service and support, a middle tier of providing additional value to our clients and top tier of new sales. “This approach results in a rate of client referencability nearing 100 percent which also drives growth through client referrals and relationship expansion. We have a culture where innovation and ideas are welcomed, as it is an imperative to the success of Absolute Performance. We believe in the mantra‘innovate and grow or perish,” asserts Shafer. The successful results of this approach include advances in such areas as business intelligence, enterprise automation, security and a highly successful global model. Absolute Performance is also strengthening its culture through a shared vision in continuous improvements being built on the foundation of six sigma. Absolute Performance also collaborates with IBM, who recognized the company earlier this year for Leadership in Technology and Innovation in the category of managed service providers (MSPs) in North America. “Being able to establish and sustain strategic partnerships is a critical success factor at Absolute Performance,” says Shafer. 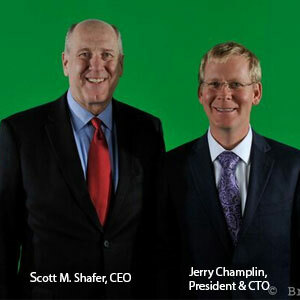 Shafer and Champlin's success in building an innovative, solutions based company has opened up new markets for the company including the transformation and delivery of third party software. The company’s Applications Performance Management capabilities coupled with success in building an innovative, solutions based company has resulted in a rapidly growing segment of the business technology transformation. “We’ve been engaged by a number of our clients to go beyond infrastructure and application performance management and transform the proprietary software of technology driven companies. This is one of our fastest growing lines of business today,” Shafer concludes.